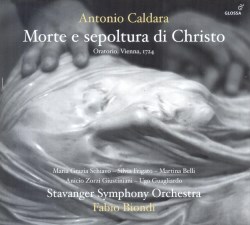 Morte e sepoltura di Christo is one of the many oratorios from Antonio Caldara's pen. He contributed to this genre from early on in his career: the first oratorio dates from 1697. The largest part of his output dates from his time in Vienna where he acted as vice-Kapellmeister at the court of the Habsburg emperor Charles VI from 1716 until his death. Oratorios were mostly performed in Italy during Lent when the opera was closed. They could be on almost any subject, either from the Bible or from the life of a saint, but always ended with a reference to the Passion of Christ. The present oratorio is different which can be explained by reference to a specific tradition in Vienna. From the mid-17th century it had been customary to perform a so-called sepolcro on Maundy Thursday and Good Friday in court chapels. Such pieces were shorter than oratorios and comprised only one act; some of them were in the local dialect. They were performed in the form of an opera, with scenery, costumes and action. This form was abandoned shortly after the turn of the century - the latest sepolcro dates from around 1705 - but the tradition lived on in the oratorios written in the next decades. The title pages of such oratorios usually included the words al santissimo sepolcro. Caldara composed his first oratorio for such an occasion in 1717: Cristo condannato. The present oratorio dates from 1724 and was written to a libretto by Francesco Fozio. It is scored for five solo voices who also take care of the choruses. The soloists represent five different characters whom we know from the Passion story in the gospels. The two sopranos are Mary Magdalene and Mary the mother of James (Maria de Giacobbe). The alto sings the role of Joseph of Arimathea, a disciple of Jesus who donated his own prepared tomb for Jesus' burial. The tenor represents Nicodemus, a member of the Sanhedrin who secretly was also a disciple of Jesus. The bass sings the role of the centurion, who - under cover of darkness and the ensuing earthquake - said that Jesus was truly the son of God. The oratorio is in two parts. In the first the five characters gather for Jesus' burial and express their feelings about his death. Mary Magdalene and Mary the mother of James recount how they are overwhelmed with tears; they feel as if they are dead themselves. Joseph of Arimathea's soul is "scattered" and Nicodemus laments about the death of a "beloved Teacher". The centurion calls what he has seen a "great portent", and the "Glory of the righteous and of the Son of God". In the next arias the characters refer to their sins as the cause of Jesus' death; Mary the mother of James expresses her love for Jesus. The closing chorus addresses Jerusalem: "Look upon your God, thus defiled for your sake, o corrupt Judaea, o thankless Israel". The second part focuses on the burial itself. Joseph of Arimathea once again expresses his love for Jesus whereas Nicodemus shows his anger of the "faithless disciple" who betrayed him, referring to Judas. Together they prepare the burial; Mary Magdalene invites the centurion, whom she calls "faithful companion", to marvel with her "at the noble honour enjoyed by that fateful rock now that it has received our Redeemer in its embrace". She then asks the "dear rocky walls" to return Jesus to her. Mary the mother of James also talks to the sepulchre: "I long for your pity, unyielding tomb". Joseph of Arimathea says goodbye: "I go: rest in peace". Mary Magdalene does the same but insists that her thoughts will stay with Jesus. The work closes with another chorus which sums up the sense of the events of Good Friday: "The great Work has been fulfilled: let his cruel death be life to us." The emotions of the characters are eloquently depicted in the music. It will not come as a surprise that many arias include sighing figures and quite some chromaticism. In contrast to many Italian oratorios of the time this work is not very operatic; the arias are not conceived as virtuosic showpieces for opera singers. It is also different from many other oratorios in that counterpoint plays a major role. That can be explained from the fact that the Habsburg emperors had a strong preference for counterpoint: around 1700 music for viol consort was still played at the court in Vienna whereas it had become obsolete everywhere else. It is not just the vocal parts that illustrate the text; Caldara also uses the instrumental parts to express the feelings of the protagonists. One of the notable features of this work is the use of obbligato instruments: the violin, the chalumeau and the trombone and on one occasion a trio of two trombones and bassoon. Around 1700 Vienna was one of the very few places where the trombone was still in use, largely due to the presence of a dynasty of virtuosic players. This tradition lasted until the end of the 18th century when Mozart worked in Vienna. By contrast, the chalumeau was a modern instrument and became quite fashionable in the first half of the 18th century; not only in Vienna, but also elsewhere. Since 2006 the Italian violinist Fabio Biondi has been the Stavanger Symphony Orchestra's artistic leader for baroque and classical music. With it he has recorded several discs of 18th-century repertoire. It is admirable how he is able to translate the principles of historical performance practice to a modern symphony orchestra. Earlier I reviewed his recording of Handel's oratorio Jephtha. I was generally quite satisfied with what he had achieved. I am less impressed by the present recording. That could well be due in part to the difference in character between the two works. This oratorio is less opulent and more intimate and, as we have seen, is dominated by counterpoint. As a result the role of the orchestra is different from that in Handel's oratorio. Here the modern instruments are much more problematic: they just can't imitate the articulation and the dynamic shading of baroque instruments. The size of the orchestra is also questionable from a historical point of view. A grouping of twelve violins, four violas, three cellos and one double bass seems quite large, especially considering that modern instruments are generally louder than their baroque counterparts. It is also the vocal part of this recording which I have reservations about. It doesn't make much sense to make players of modern instruments perform in baroque style when some of the singers largely ignore it. Especially Anicio Zorzi Giustiniani and Ugo Guagliardo produce a sound which reminds me of the way 19th-century Italian operas are sung. There is too much vibrato, but their singing is also too pathetic. I don't like the tearful voice of Giustiniani in the recitative 'O Redentor', to give just one example. Maria Grazia Schiavo and Martina Belli make a better impression but they are also far too liberal with the vibrato. Stylistically only Silvia Frigato can fully convince. Overall the text should have been more the centre of attention. The voices don't blend all that well. That comes especially to the fore in the two motets which precede each of the parts of the oratorio. I don't see the need to add them as they have no specific connection to Passiontide. There are also instrumental interludes by Caldara, Fux and Vivaldi and again, I see no reason for their inclusion other than to make the playing time a little more acceptable. However, although I sometimes criticize the short playing time of discs, in cases like this that is the consequence of recording an oratorio from the early 18th century. Such a piece is for the most part not going to run longer than about 90 minutes. This seems to be the only recording of this work available right now. For that reason it deserves a welcome but only with considerable reservations. Considering this work's qualities it definitely deserves a recording on period instruments and with better vocal performances.